In the previous iteration, I noted the pump got quieter with regard to vibration within the first 24 hours. I think this was merely due to the rubber needing to be loosened up before it could give its full isolation potential, as the isolation got better over time. The pump noise was never completely eliminated either. So what else could I do about the noise and vibration? I conjectured swapping out the D5 Strong for the D5 Vario (likely at 12V, not higher). But I also could not determine if that could happen until I had the GPU block installed. And then there was the matter of the case feet. I did a quick test to determine if better case feet would help with noise by resting the radiator box on a pair of dish towels. No difference. Even picking the radiator box up and holding it in the air didn’t make much difference to noise. But I figured the AcoustiFeet would still be a decent option and ordered them anyway as I could feel vibration being transferred to the table. I also ordered anti-vibration silicone rubber washers. The aim was to also eliminate vibration on the fans in the radiator box. My primary concern lay with the three Bitfenix Spectre Pro 120mm fans pulling air across the box at the rear. They are held in with #8-32 screws without any kind of isolation. And the design of the Spectre Pro shell makes it impossible to use vibration isolating mounts. So your only option for vibration isolation is rubber washers. I was not concerned about the bank of nine (9) Cougar CF-V12HB fans, since they have their own vibration isolation at the corners. Plus the entire bank becomes virtually inaudible below 9V unless you listen to them like a seashell on the beach. The Spectre Pro fans also become similarly inaudible at that low of a voltage, but there is still some vibration transfer to the chassis due to how it’s mounted. Thankfully I was able to order the block and backplate from a US supplier. 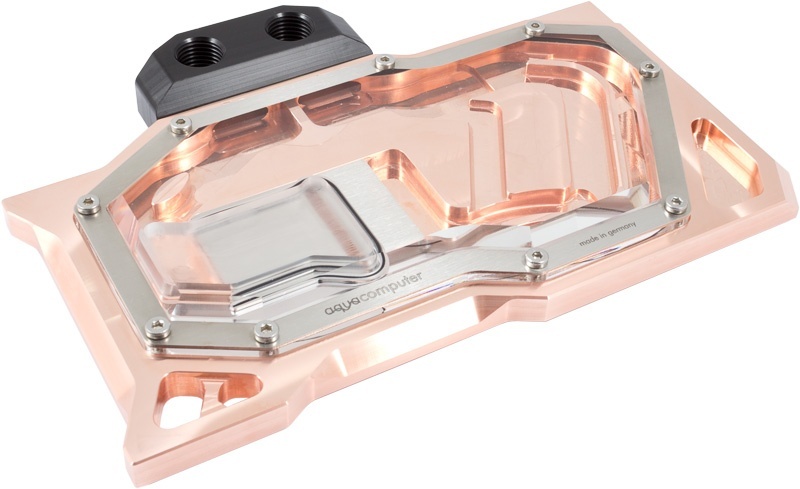 Aquacomputer kryographics. Less expensive than EK while providing for about the same performance and quality. So did this block provide so much resistance that I was forced to up the voltage on the pump for the sake of temperatures? Or was I able to swap out the D5 Strong for the D5 Vario? Initial temperature performance left me very optimistic about swapping out the pump. 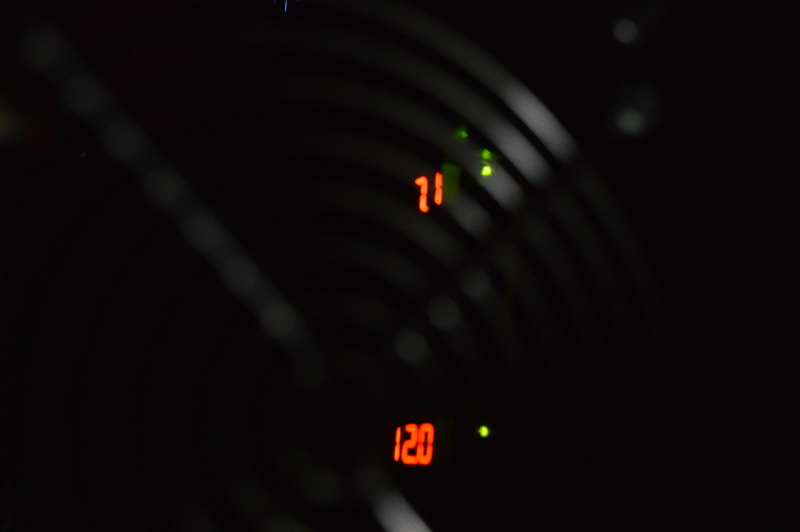 First, as you can see above the pump is at 12V and the fans are at 7.1V. The card is not overclocked, but I do have its power target set to 112% in EVGA Precision XOC. Under Unigine Heaven on maxed-out settings and letting it run for the better part of an hour, the temperature leveled out at 36°C and the GPU clock topped out at 1987 MHz. And a 30-minute Furmark test showed similar, maxing out at 36°C, but fluctuating between 35 and 36. Again the clock topped out at 1987 MHz. The passive blackplate was also noticeably warm to the touch near the voltage regulators. Airflow to the backplate is partly obstructed by one of my hard drives, but there’s no cause for concern here. I’m considering replacing the thermal pads with the better Fujipoly pads for better cooling on the voltage regulators. So with these results, it is safe to say that I could swap out the pump for the potentially quieter D5 Vario. Flow would still be the overriding concern here, and if I had reason to believe the Vario wasn’t going to be able to keep up the flow, then I could send it above 12V or reinstall the Strong. There are a few other smaller changes I’ll be making to the radiator box as well. 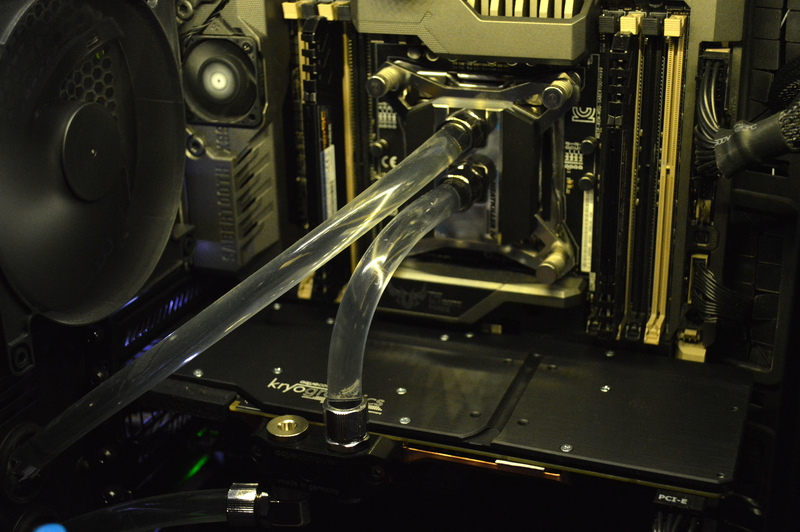 I noticed there is some vibration being transferred up the tubing to the reservoir, so vibration isolation on the reservoir mount will be beneficial. And there will be some other minor changes related to cable management. In short, likely tearing the whole thing apart again, which will be needed anyway just to replace the pump. And now for some more benchmarks. Latest score is in black, my previous score with my pair of GTX 770s is in red. So not as striking an improvement moving from a pair of GTX 770s to the single GTX 1070. 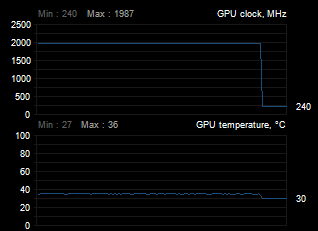 But from two graphics cards down to one and seeing a performance gain is still welcome. If this was a GTX 970, the gain would’ve likely been barely anything. So still more to come with regard to changing out the pump and some other minor changes to the radiator box. 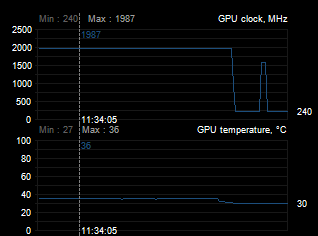 I might even try overclocking the GPU and CPU to see what I can get out of it. The temperature performance of the loop gives me a lot of room to maneuver.